Last week, EQMM January 2016, the first issue in our 75th year in continuous publication, went on sale. I hope you’ve seen it! In celebration of this diamond anniversary year, special features are planned for each of the 2016 issues. Before we close out 2015, I’d like to give you a preview of some of what’s coming up . . .
Several themed issues are ahead too, including March/April’s nod to a goal stated in the manifesto for EQMM: “to raise the sights of mystery writers generally to a genuine literary form.” Many of the stories in this jam-packed spring double issue are by writers with feet in both the mystery genre and the world of mainstream literature. In May, in commemoration of the “All Nations” issue of August 1948, we bring together stories from all continents but Antarctica, most in translation, all revealing how interconnected the world of crime fiction has truly become. June 2016 celebrates the Mystery Writers of America with stories exclusively by writers who have won one of the MWA’s awards, the Edgar or the Robert L. Fish Award. In July, authors who got their start in our Department of First Stories claim the spotlight; even if you didn’t see their EQMM debuts in years past, you’ll know who most of them are now! 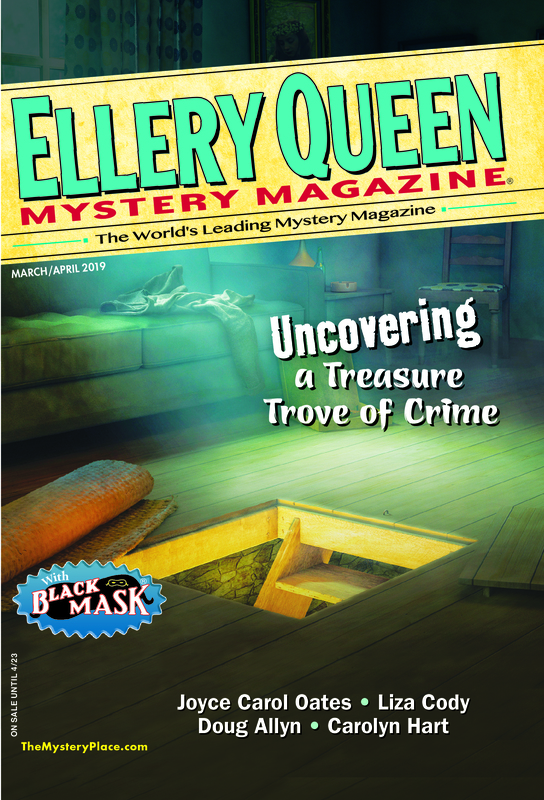 August is dedicated to EQMM’s past editors, with articles about the lives and editorial contributions of Frederic Dannay, Manfred B. Lee, and Eleanor Sullivan, plus a short story in which Fred Dannay stars as sleuth, in a case involving Dashiell Hammett. And September/October? That’s the issue we’ve chosen to correspond to “Fall 1941,” EQMM’s first issue—therefore, the designated “anniversary issue.” We’re going to keep to ourselves for a little while longer some of the special contents of that issue, except to say that its cover is a new work by famed American artist and designer Milton Glaser (whose first published art was a 1954 cover for EQMM) and to let you know that the scene will be set by an article from Marv Lachman on the world of 1941—the literary setting and the wider environment into which EQMM emerged, on the brink of the America’s entrance into World War II. A number of nonfiction pieces in the 2016 issues focus specifically on EQMM’s history. What has made this especially exciting is that information not previously available to us was unearthed recently by Ellery Queen biographer Jeffrey Marks at the Library of Congress, including the original contract for EQMM (between Frederic Dannay and Manfred B. Lee and The American Mercury Press) and the transcript of an oral-history recording in which EQMM’s first publisher, Lawrence Spivak (best know as the founder of the TV show Meet the Press) talks frankly—and surprisingly—about how the idea for EQMM came to him. In addition to the year’s special issues, our anniversary celebration will include a two-month EQMM exhibit at Columbia University’s Butler Rare Book and Manuscript Library, from mid-September to mid-November 2016. The library’s excellent curators have a wealth of edited manuscripts, correspondence, and art to choose from, and we hope those in reach of New York City will stop by and have a look. Also coming up is a half-day symposium hosted by Columbia University in September 2016. Stay tuned here for the date, topics, and participants—we should have it all finalized soon. It’s due largely to our intelligent readers and talented writers that we’ve reached this happy milestone in the magazine’s history, and as we close out another successful year (something I find a little bittersweet!) and launch into 2016’s celebrations, I want to thank all of you, on behalf of all of us at EQMM, for coming on this journey with us. This entry was posted in Anthologies, Awards, Books, Business, Ellery Queen, Fiction, Genre, History, Magazine, Readers, Writers and tagged anniversary, celebration, diamond anniversary, eqmm, history, milton glaser, periodical, publishing, year ahead. Bookmark the permalink. Wow! What an exciting year! Congratulations to Janet and all the folks at EQMM who put each issue together and treat readers and contributors with such professionalism and respect. Truly a class act!